Phone docks with personality are a fun find and one that actually takes sound seriously is even rarer still. 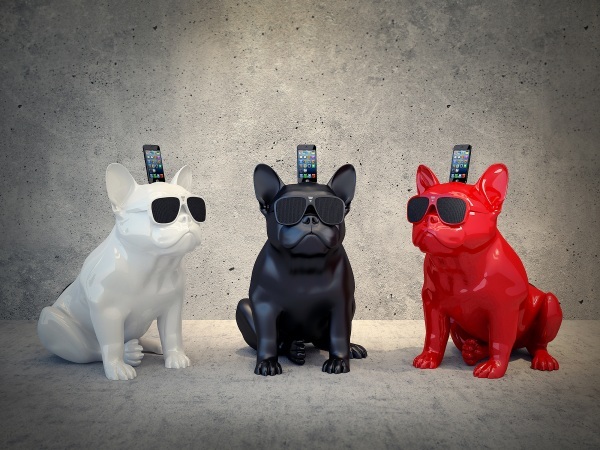 Usually they are small, desk sized contraptions but this isn’t the case with the AeroBull, the speaker that doubles as a work of art and will probably end up replacing your real dog as your best friend. The AeroBull, or should I say Adora-Bull, is the French bulldog for people who can’t have dogs. Or just need a speaker more than they need a lifelong companion. This little puppy comes in three colors, white, black, and red all of which wear super fashionable sunglasses. Sunglasses that sound comes out of instead of a mouth that barks. Designed as an iPhone dock, you could actually use this with any music playing device that has a headphone jack. It even has Bluetooth so synch up and rock out. Basically, if it makes music, this doggie is down to play it whether it be a smart phone, CD player, or whatever else you fancy. The AeroBull is €1,299 and is set to come out at the end of November.